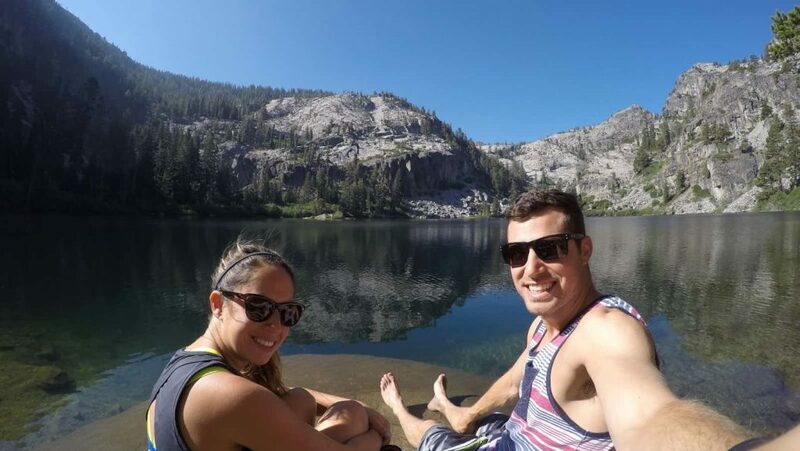 This weekend our Miles and Points Success story was featured on Million Mile Secrets! I’ve always been a big fan of Million Mile Secrets. 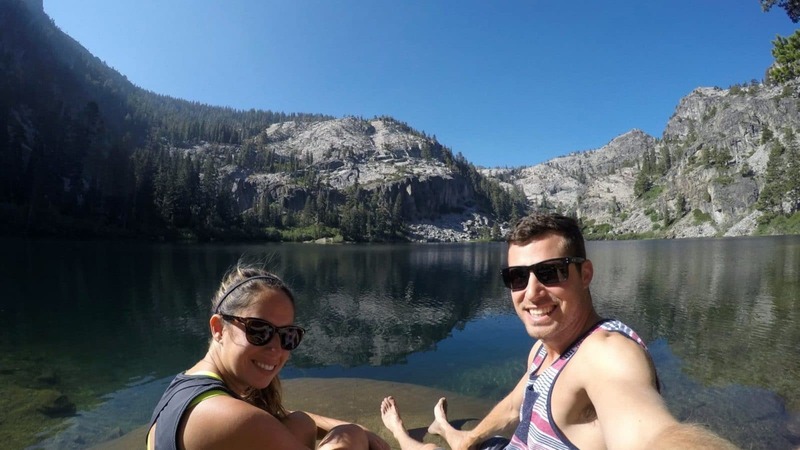 They were one of the first travel blogs I started reading. They helped me learn how to travel with points. Before being featured, I answered all of their Interview Series questions with the hopes of getting it featured on their website. Unfortunately, it turns out they’re not currently featuring those interviews. Instead of wasting all my answers, I figured I’ll share them here on Travel Freedom! So, here are my answers to the interview series questions from Million Mile Secrets travel blog. It all started with a root canal. When I saw the jaw-dropping price of my dreaded root canal in 2012, I quickly started looking for a way to make some of that money back. While searching the internet for credit cards that offered cash signup bonuses, I came across a travel blog that caught my interest. It was the one and only Million Mile Secrets and it’s intriguing author Daraius, who explained to me, how I could get much more value by earning travel points instead of cash. 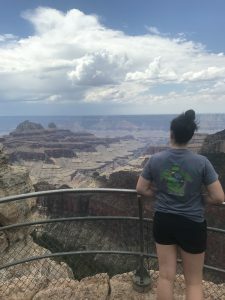 I had never done as much traveling as I’d wanted to do, simply because it was so extremely expensive, and I didn’t make much money following college. 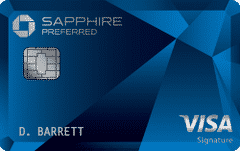 I jumped at the opportunity and applied for the Chase Sapphire Preferred credit card, and I’ve never looked back! I’m now twenty-six credit card approvals deep, have earned nearly 2 MILLION miles, and have saved tens of thousands of dollars. That’s not even the best part of it! I’ve had the chance to experience places and activities that otherwise, I would not have been able to experience. The world of miles and points has changed my life! 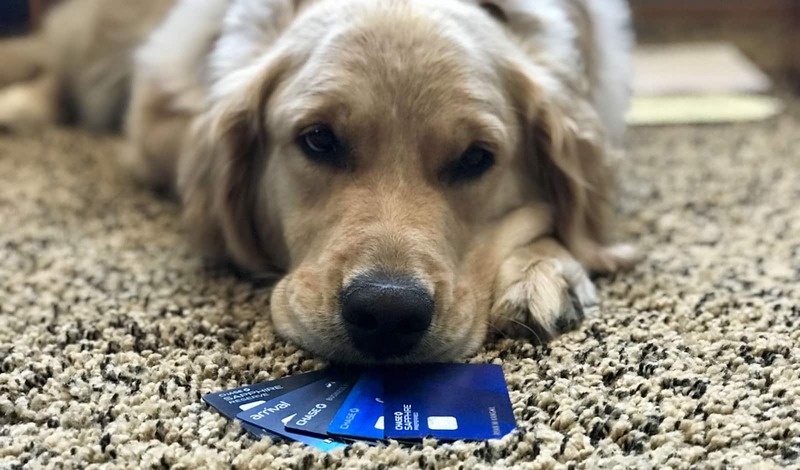 There are a lot of misconceptions when it comes to traveling using points, and more specifically points earned through travel credit cards. Most people’s first thought when they’re introduced to traveling for nearly free, using points and miles, is “What’s the catch?”. I help people who are similar to myself, who deserve to travel, get past these common misconceptions. My goal is to teach as many people as possible how to enjoy the perks of travel, without spending much money at all. The Travel Freedom blog is just the beginning of the story… Travel Freedom is a work in progress to become a larger travel company. It will eventually include travel courses focused on traveling with points, a mobile forum for talking travel with other like-minded travelers, and we will be a travel products manufacturer. Obviously, not all of these Travel Freedom features have rolled out yet, but they are in the planning stages. We just launched the beta version of our course titled “Travel Using Points (instead of dollars)” and it’s currently available absolutely free of charge. 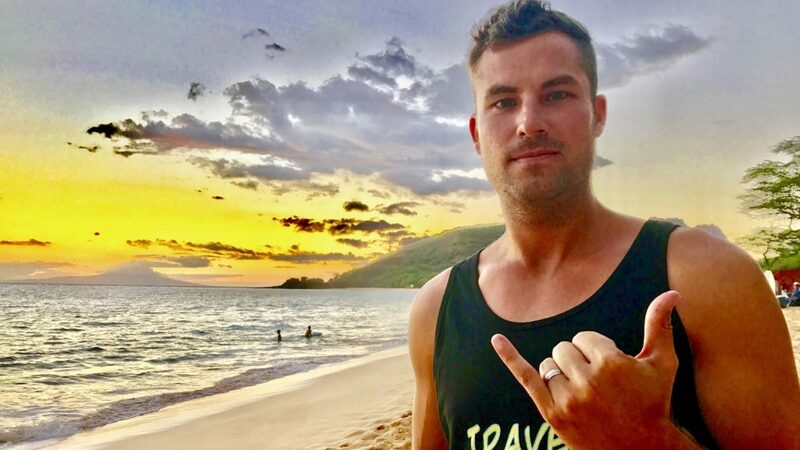 Starting a travel business is a mix of both worlds that peak my interest. 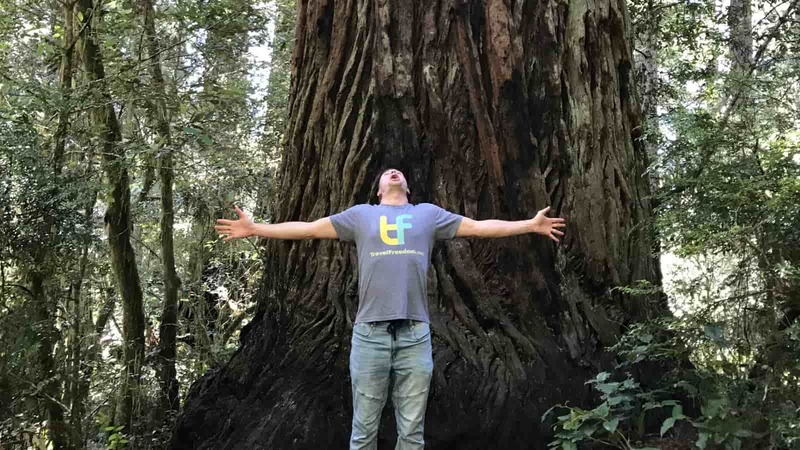 Both, entrepreneurship and traveling with points, have been in my heart for the past few years. 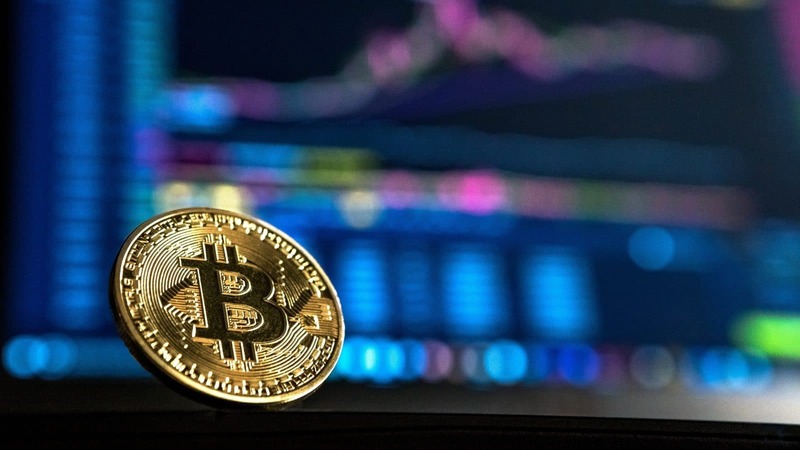 I continually learn and grow within each of these topics, so it only makes sense for me to take a shot at joining the two in an attempt to build an everlasting business. Spend more money! No, just kidding… That’s a bad idea unless you can really afford it. The one single thing that will ALWAYS bring in the most miles, is applying for new credit cards. Always be earning an introductory offer. If you aren’t currently busy meeting the minimum spending limit for a new credit card, you’re probably not doing it right. Just think of it this way: on your next $3000 of purchases, you can earn 3,000 miles (1x miles per $) on a card you already have, or alternatively you can earn 53,000 miles (~17x miles per $) or more if you’re earning an introductory offer! I’ll take the signup bonus, please! We love to hike, especially when there’s water to jump into at the end! 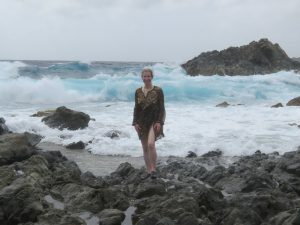 I’ve been fortunate enough to visit all of the main Hawaiian islands (some multiple times) thanks to miles and points. Each time I’ve visited, it’s cost me only about $11 per person due to a little trick. I’m sure some of you know about it. Using British Airways miles to book direct flights on their partner, Alaska Airlines, from the west coast to Hawaii. It only takes 25k miles plus the taxes and fees which currently comes out to $11.20 for a round trip! British Airways is a transfer partner of Chase Ultimate Rewards, which means that there are multiple credit card offers that will give you two or more round-trip flights to Hawaii. This is actually the most common thing for friends to ask for help with, and I’m happy to help them. 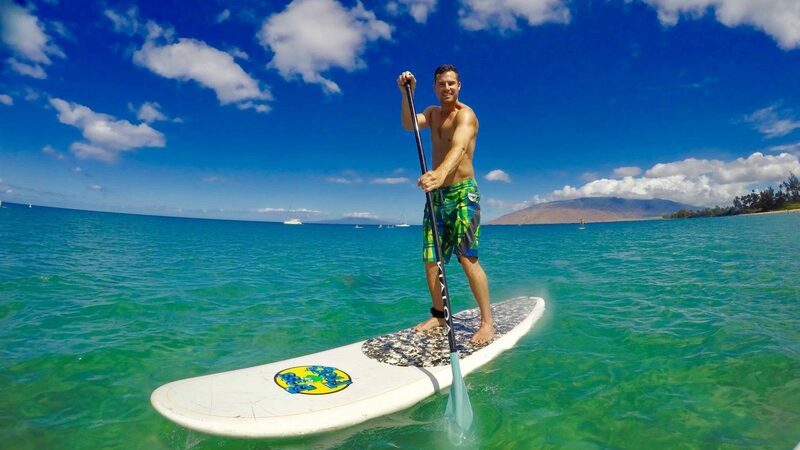 Everyone needs a little (or a lot) of Aloha in their life! 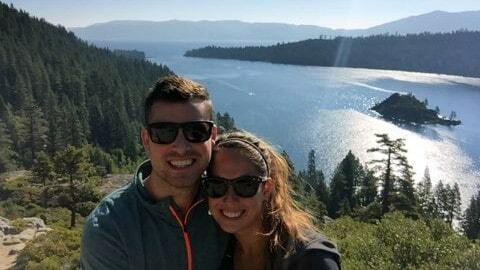 Lake Tahoe is one of our favorites. As great as Hawaii is, it’s actually not my most memorable travel experience. 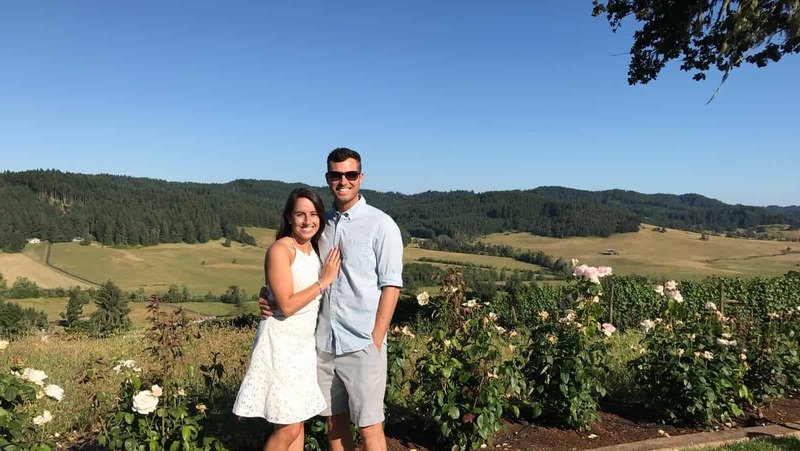 My absolute best travel experience that is insurmountable, was flying to Virginia to meet my now wife, for the first time. We met through mutual friends, and had been talking 24/7, but lived a whole country apart. I was falling for her, so decided to put my points to use and go meet her in person. Friends and family are usually very intrigued, but also somewhat skeptical. It often comes down to misconceptions about credit that they have. I find it unreal what percentage of people have absolutely no clue how their credit score really works. Every time I tell someone I’ve had 30 different credit cards in 6 years and had my credit score climb, they seem stunned. The ones who can see past their credit misconceptions, and see how often my wife and I travel, want to get started earning miles and points for themselves! I find that most people don’t really want to put in the effort to learn how to use points for travel for themselves. This is why I’m building a video course to make learning as easy as possible. My friends who decide to jump in seem to have great success. For instance, my sister-in-law decided to use credit card points for her Hawaii honeymoon. 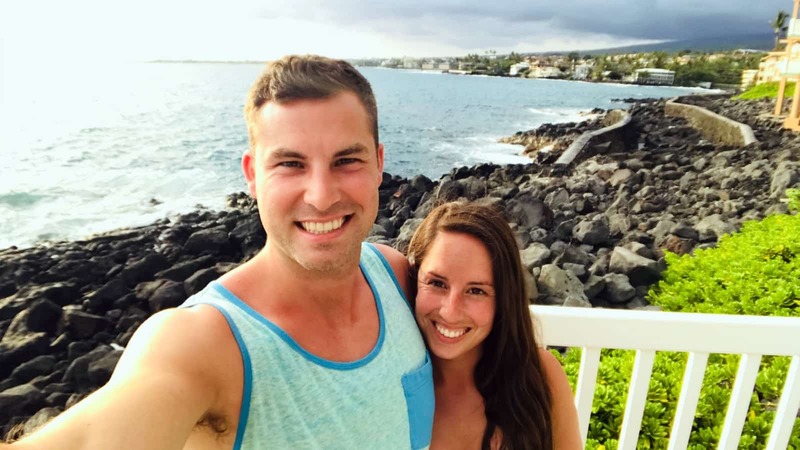 Sean and Amber on their two-island Hawaiian honeymoon! Congrats! 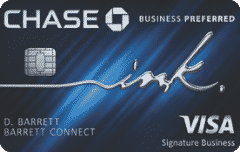 With a little guidance, she decided to get the Chase Sapphire Preferred credit card. She put all of her wedding expenses on it. 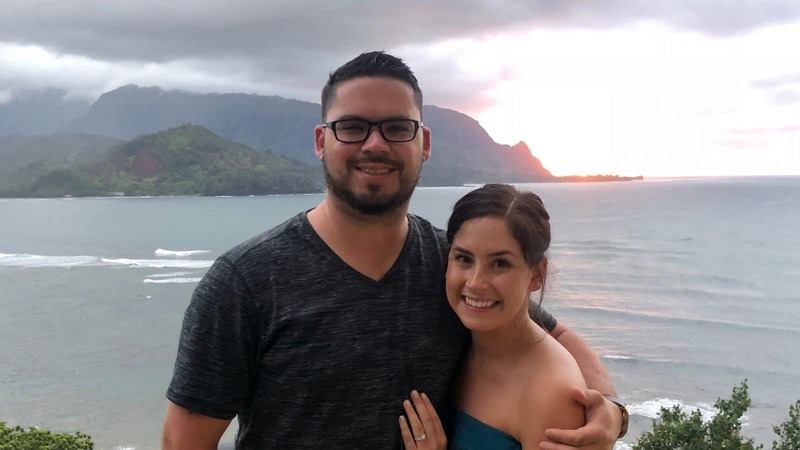 Within a month, she earned enough points to book their flights to Maui and Kauai, saving nearly $1,500 (that’s a lot of extra Mai-Tai’s they can afford now)! It’s definitely rewarding to see others find the power of points and knowing that I had a part in pointing them in the right direction. First off, using airline partners for booking can save tons of miles, and I’m all about efficient use of miles and points. For instance, the partnership between British Airways and Alaska Airlines allows me to regularly fly from the west coast to Hawaii for only 25k miles! I also plan on using a similar partnership to fly from the East coast to Ireland for the same amount of miles. Second, having a points travel partner can pay off big time. Whether that’s a friend, a family member, or a spouse, it can help you both travel easier. If you have two people working together, that means you have twice as many signup bonuses available to you. Where I’ve found this to be insanely profitable, is with the Southwest Companion Pass. If you haven’t heard of it, you need to study up. It gives you a free companion on EVERY flight for the year you earn it, AND the following year. Year 5 and 6 of Having a Southwest Companion Pass! B1G1 FREE FLIGHTS!!! So, say you earn it in February of 2018… That means you have buy-one-get-one-free flights using either money or miles for a whopping 23 months! 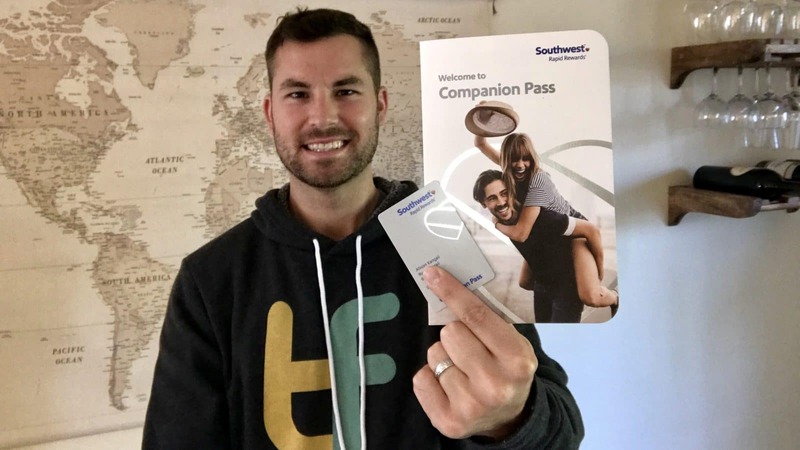 Oh, and the Southwest Companion Pass can be earned as easily as signing up for two credit cards… I’m not sure how this deal still exists, but it does! My wife and I trade off earning it every two years so that we almost always have one between the two of us. When I first began my journey in the world of traveling with points and miles, I would sign up for every single travel blog giveaway I saw. Surprisingly, I ended up winning the grand prize of a contest on Facebook that gave me 100,000 SPG points! I couldn’t believe it when they emailed me to tell me that I won. I figured it must be some sort of scam, but followed through, and I really did win. Those points went on to give me thousands of dollars worth of travel both through their hotels and their airline transfer partners. That actually wasn’t the only giveaway that I won. Within a year I won somewhere between 5-10 giveaways from different travel bloggers. I even won two separate giveaways run by Million Mile Secrets! If I remember correctly, one was a pack of Italian products from one of their vacations, and the other was a Swiss Army digital bag tag and travel garment sleeve! So thanks again, for all those giveaways, millionmilesecrets! Remember, there has to be a winner, so why shouldn’t it be you?!? These events helped give me the mindset “you won’t get it if you don’t ask for it”. I’ve found that it never hurts to ask for an upgrade or a discount. Whatever you ask for, may possibly be given to you! Have a Plan! When I started out, I jumped in without much of a plan at all. I wanted to earn as many points as possible but didn’t know what in the world I was going to spend them on. If I were to go back, I would make tentative travel plans and then work backward to get whatever credit card works best for that specific vacation. I’ve found that miles and points are always changing, so it’s best not to hold onto them for long periods of time. They may become devalued while you hold them, or a better offer for those same points may arise. I also love playing sports, but I’m getting to the age where my body doesn’t like staying in one piece when I play. 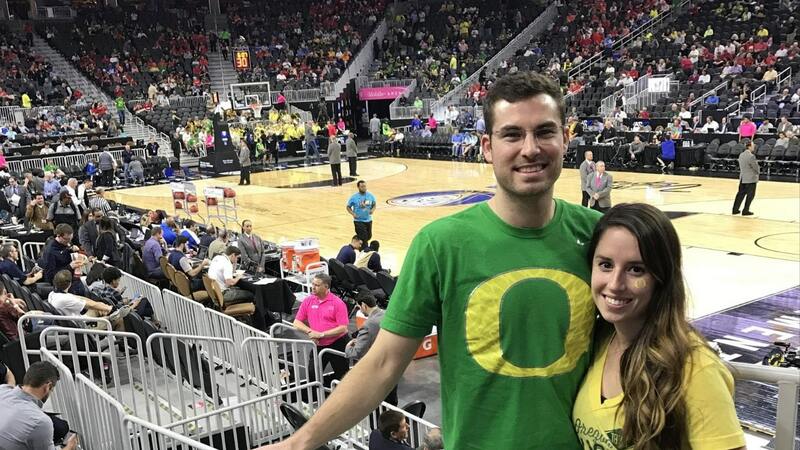 My favorite sports are basketball, football and more recently soccer (thanks to Allison who played in college). Golfing is also a lot of fun and my body has an easier time keeping up with it. If you are someone who is interested in travel and has a good credit score, take advantage of traveling with points! SERIOUSLY!!! With the high prices of travel, and the willingness of banks to hand over free points, you might as well be getting something out of your good credit! There is basically an unlimited amount of points and miles out there for the taking. It might as well be you that takes them! Earning points through travel credit cards has changed my life in ways I would have never expected. From flying to Hawaii by myself for a few days “just because”, to flying across the country to meet who would end up being my future wife, in first class. These are things I never would have imagined doing just ten years ago because I literally wouldn’t have been able to afford them. If you have an itch for travel, go ahead, jump right in. I’ll take a wild guess that you won’t look back! If you’re interested in traveling like us, check out our Best Travel Credit Card post. It will explain which travel credit card is the best to get first, and why. Welcome to Travel Freedom’s “Traveling With Points” interview series. We regularly feature travelers who take advantage of points and miles to enjoy adventures all around the world. You will get a glimpse into the lives of people who are already traveling by using points and miles. Let’s get it started and jump into our newest interview! 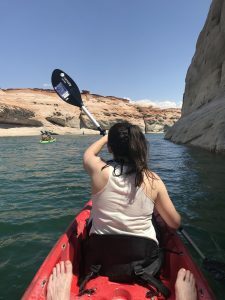 Kayaking in Lake Powell, part of Antelope Canyon. The water is so beautiful and perfect to swim in after kayaking and visiting Antelope Canyon. that as much as possible. 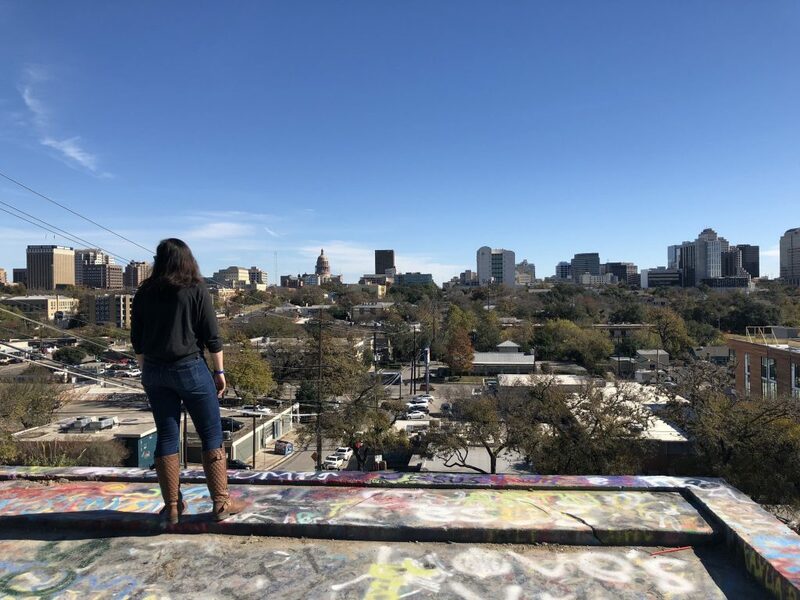 I’ve been based out of Texas for the last year but am moving back to New Jersey in the fall– all those trips home really helped with racking up the miles. Aside from traveling, my fiancé and I both have the goal of having children and becoming FIRE (financially independent, retired early), so saving money while traveling is really important to us. It’s been just over 3 years since I started collecting miles and points to travel for less. And, as of August 2018, its been exactly 3 years since I first redeemed my points for free flights. How did you first find out about this somewhat secret world? I found out about miles and points through a friend of mine who loves Reddit. After we took a trip together and realized it was much too expensive to sustain. She saw something on Reddit and was telling me about how signing up for credit cards to earn the bonuses, then cancelling later was a way to get free or really discounted travel. Skeptical, I did some of my own research and decided to give it a try. From then on, she and I’ve been hooked on finding the right cards to take all the trips we want! 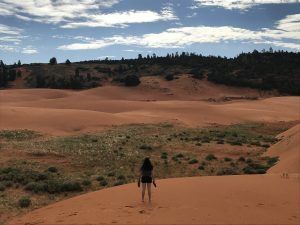 Admiring the the sand dunes in Coral Pink Sand Dunes park in Utah. What was the first trip you took using miles and points? My first trip was to Germany with my soon to be husband 3 years ago. I did a post on it a while ago and the story was also featured on Million Mile Secrets. What’s the best credit card introductory bonus you’ve ever received? My most prized introductory bonus was when I heard the 100k bonus that was originally offered with the Chase Sapphire Reserve card. It wasn’t all that much spending to earn it, but I’m still spending that bonus! What do your friends and family think of your points and miles traveling? Ha. They think I’m ruining my credit score or spending a ton of money I don’t have, to travel. Others don’t understand. They think I waste a lot of my time trying to keep up with the programs and earning bonuses. The funny thing is, I’m on my way to retiring early while traveling multiple times a year and after setting reminders, I don’t spend too much extra time keeping up with it all! 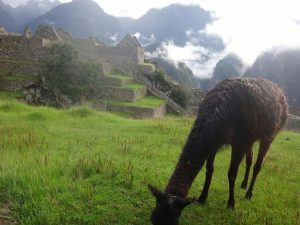 My favorite photo from our time in Peru, the lama posed perfectly to get the ruins in the background. We also saw a double rainbow over the ruins when we first arrived! What is the best trip you’ve taken? Tell us a little bit about it. The best trip I’ve taken was to see Macchu Picchu in Peru. 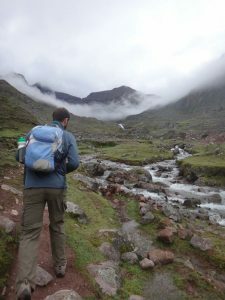 I use Scott’s Cheap Flights to keep an eye out for good deal airfare and saw some great prices to Lima, Peru. When I checked out the Chase Travel Portal, the deal translated to points too! So, we booked our flights with Chase points from my CSR introductory bonus and worried about the rest later. We ended up using more Chase Points to stay in a hotel in Lima, but did AirBnb in Cusco before and after the trek to Macchu Picchu. The trek was beautiful. Plus, since it was the off season, it was a private tour for just the two of us! The landscape and wild life was spectacular, and I won’t soon forget it. Mr. WkndMom and our guide during the trek through the mountains to Macchu Picchu. No, that’s nothing funny with the camera, the clouds and mountains actually looked like that! How often do you travel now, compared to before you knew about traveling with points and miles? I’m certainly limited to my vacation days, but I definitely travel a lot more than I thought I would. Because I got into this hobby right after I got my first full time job, I never had a chance to not take vacations. My fiancé, though, went from never traveling and losing his vacation days every year, to taking multiple vacations per year and seeing everything with me. We have three trips coming up: La Jolla, CA, Cancun, MX, and island hopping through Hawaii. Even though La Jolla is a work trip for me, so I’m not paying for any of it, we were able to get Mr. WkndMom there for free because I have the Southwest Companion Pass. We’re also going to Cancun on 2 for 1 flights thanks to the SWCP where we’re planning to stay in an all-inclusive resort for a scuba adventure. Hawaii will be our super extravagant diving liveaboard honeymoon and we found discounted flights that we booked through CSR points for free too! A view of the Grand Canyon, North Rim. Some pretty crazy thunder and lightning was happening behind the camera but you couldn’t tell looking out over the canyon. What is your best tip for people just getting into traveling with points and miles? Set a single goal and get there with Chase points. They are the easiest to earn and use, and they are very versatile. You can’t go wrong starting with them because they also transfer to many travel partners. At first it may seem weird that you’re getting all of this for free. Remember, you’re being rewarded for borrowing money and paying it back! Thank you for letting us dig deep into your travel experiences. Your vacations all sound amazing! Macchu Picchu is definitely on my Bucket List. Also, I’d love to join you in becoming FIRE!!! 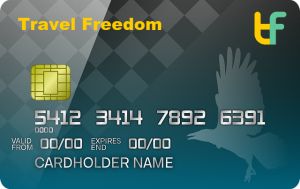 Would YOU like to share your points & miles journey on Travel Freedom? We would all love to find out how YOU travel using points and miles! If you’d like to be considered for a future “Traveling With Points” interview, please EMAIL US. We’re always happy to hear more success stories in the points and miles community. Welcome to the first episode of Travel Freedom’s “Traveling With Points” interview series. We will regularly be featuring travelers who take advantage of points and miles to enjoy adventures all around the world. You will get a glimpse into the lives of people who are already traveling by using points and miles. Let’s get it started and jump into our first ever interview! I am passionate about travel and good food. I travel for food. I am divorced and have two grown children, ages 24 and 20. Since American Airlines (AA) introduced points, but I grew up with a mother who always chased the deal. She once booked the Eastern Airlines promotion where we could fly anywhere Eastern Airlines flew for 21 days as long as we went in the same direction. It was an incredible trip to Bermuda, Jamaica, Las Vegas and Mexico. We looked like jet-setters when we were just a typical American family. Someone told me about the AA card when AA introduced it. But I upped my game when I met a couple at a safari lodge in South Africa who told me I could get two free Park Hyatt nights from a sign-up bonus. I had never heard of sign-up bonuses until then. I was obtaining points from regular spend. Learning about the sign-up rewards was a game changer. We flew to Nepal using points. Although, at the time we could only fly to Frankfurt on AA and then we had to pay for the flight from Frankfurt to Kathmandu. Recently, the Ritz Carlton bonus was initially three-nights free at a four-star Ritz-Carlton. The Ritz-Carlton Aruba fell into this category. My status at the time entitled me to free breakfast, and the front desk clerk insisted my stay included a resort credit. The hotel knew it was my birthday, so they upgraded my room and provided me with special treats. A standard room alone would have cost $1,908, but I paid nothing. My fantastic stay was an incredible use of my certificates. Plus, I received the travel credit and the other perks. Sadly, the card no longer exists. Although, years ago, AA used to give free night certificates with AA awards. For some bizarre reason, we never used them. But once we returned home from France and our home’s construction wasn’t finished. The contractor didn’t get around to installing the staircase. So we had to move to a hotel. Suddenly, I remembered having a stack of free night certificates. We took the pile and booked a room at the newly opened, first W Hotel, on Lexington Avenue in NYC. The room was so tiny that we had to be upgraded multiple times to fit four people in the room. The manager wasn’t happy that we were about to camp out in the hotel for about a month for free. Plus, my children didn’t fit the profile of the W’s demographic. The manager agreed to let us stay for a week. My daughter still remembers marching down the elevator in her school uniform and wondering why everyone wore black? My children and friends think I am insane but yet, they can’t believe the trips I take. My daughter has zero interest in obtaining sign-up bonuses, but she is happy to join me on trips. As good as I am, I think my mother was better than me. She would never leave a point on the table. When my mother died, she was so frustrated that she couldn’t use or gift us some points, that she used them to obtain gift cards. She refused to draft a will, but she left a stack of gift cards for my brothers and me. 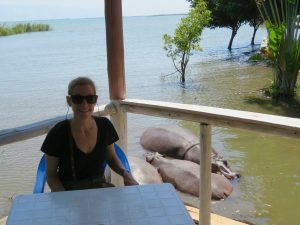 In Burundi, dining at Cercle Nautique De Bujumbura and request the table on the terrace to dine adjacent to the hippos. Does it get better than this? After my divorce, the judge stuck me with substantial legal bills despite me being the non-monied spouse. I have never carried debt in my life. So, I slashed every expense. I sold my car, cut chords and eliminated shopping to pay-off the six-figure debt. I am never one to waste a crisis and view obstacles as opportunities. One attorney permitted me to pay him using credit cards and didn’t charge me interest. So, each payment to him resulted in a sign-up bonus. In about three years, I earned over two-million points in sign-up bonuses alone excluding free nights. The points and sign-up bonuses have enabled me to take incredible trips. My most recent trip was epic. 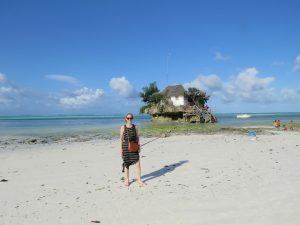 I traveled for seven weeks in East Africa and the Indian Ocean. All of my international flights were on points. I went to Cote d’Ivoire, Ethiopia for transit, Burundi, Zanzibar, Rwanda, Uganda, South Sudan, Comoros, Mayotte, Madagascar, Zambia, Mozambique, and Malawi. My goal is to visit every country in the world, and this trip added quite a few new destinations. Above: In Zanzibar, go to The Rock Restaurant for an incredible meal at one of the coolest restaurants on a rock. Pro-tip: You may need to walk through the water in low tide so don’t wear a long dress and bring swim shoes. I transferred Amex points to Aeroplan for Ethiopian Airlines (ET) flights, since Aeroplan allows one stop in addition to an open-jaw. My flights were EWR>ABJ>ADD>BJM and then LLW>EWR (airport codes). Plus, ET had an overnight in ADD with a free hotel. Although, the hotel was disgusting, so if I ever transit again, I would pay for my room next time. Free is not good when the sheets and carpet are stained. Planning the trip was complicated until I discovered an outstanding site, AwardEx.io. It’s a game changer and simplified the process for me. 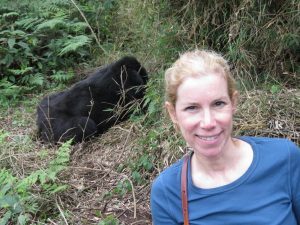 Seeing the gorillas in Rwanda was my number one bucket list item. Can you believe how close I am? converted to $500 when booking a $500+ flight. The only issue is finding an agent who understands the program. I used the bonus to pay for a pricey plane from TNR>LVI. US Bank’s Radisson card provided two free nights at the Radisson Blu in Kigali, Rwanda. I used points plus spend at the Park Hyatt Zanzibar so that I would still receive points, and get a better rate for my points. Both properties were outstanding. I also used the Citi fourth night free program for my hotel in Mozambique toward the end of the trip when I knew I would need a little R&R. My Capital One Venture card paid for my pricey Microlight flight over Zambia’s Victoria’s Falls. emailing properties directly sometimes saves money but not always. Sometimes, the OTA’s have better prices. Our family, including my grandmother always traveled extensively including when I was younger. After my siblings and I were grown, my mother was away so frequently; it was hard to remember her schedule. Travel is part of my DNA. The points have enabled me to continue traveling. I travel when I can leave. Sadly, my divorce while final, continues after eleven years. Even on this trip, I was served yet another motion. It is mind-boggling how a person who has money can use the judicial system to torture another person. Traveling provides me freedom. Hence, I am writing a book, Passport To Freedom. My goal is to travel to all 193 UN countries and the Traveler’s Century Club’s (TCC) 327 destinations. To date, I have visited 116+3 UN countries and 160 TCC destinations. I am in the process of planning my future trips, but one of my tours is to see the polar bears in Churchill, Canada. Again, the flights are on points. The process can seem overwhelming. But, its best to start small. I always recommend a person who can manage credit, pull their three credit reports and go over them with a fine tooth comb. Make sure the information is correct. You don’t want a bank to decline you for inaccurate information. My credit report said I worked in a pizza shop and had a lien in Lewiston, NY. Neither was correct. If there is wrong information, then contact the reporting agency. If they don’t correct it quickly, then file a report with the CFPB. It’s online and thanks to Senator Warren. The reporting companies resolve the issues rapidly. Then start with the Chase cards while you are under the 5/24 mark. But read a few 101 Points guides for guidance after you get your feet wet.